Zondeni Veronica Sobukwe was born on 27 of July 1927 in Hlobane, Natal (now Kwazulu-Natal), South Africa. Mrs Sobukwe (then Miss Mathe) was a trainee nurse at Victoria Hospital in Lovedale, Eastern Cape. The nurses at the hospital had been involved in a labour dispute with hospital management at the time. She was one of the strike leaders when Mr Robert Sobukwe first met her. Owing to her involvement in that strike, she was expelled from Lovedale College. She went to Johannesburg after being sent there by the then Fort Hare African National Congress Youth League (ANCYL) to deliver a letter to Walter Sisulu to bring to his attention the plight of the nurses on strike. The bond between Zondeni Mathe and Robert Mangaliso Sobukwe grew and on 6 June 1954 she married him. She received the traditional bridal name of Nosango. Together they had four children: Miliswa, Dinilesizwe, Dalindyebo and Dedanizizwe. Robert Mangaliso Sobukwe was a founding member and the first president of the Pan Africanist Congress (PAC). In her capacity as a wife, a health practitioner, and an activist, Mrs Sobukwe wrote several letters requesting meetings with officials regarding the conditions surrounding her husband while he was in jail on Robben Island. She challenged the Apartheid government, demanding her husband be released by the then Minister of Justice, Jimmy Kruger and Prime Minister B.J Vorster. She also appealed to Vorster to grant her husband and her family permission to leave South Africa but Vorster refused. She had also previously challenged Verwoerd to release her partner but parliament and the opposition rejected it. In fact, but for Helen Suzman, parliament supported Sobukwe's continued incarceration. 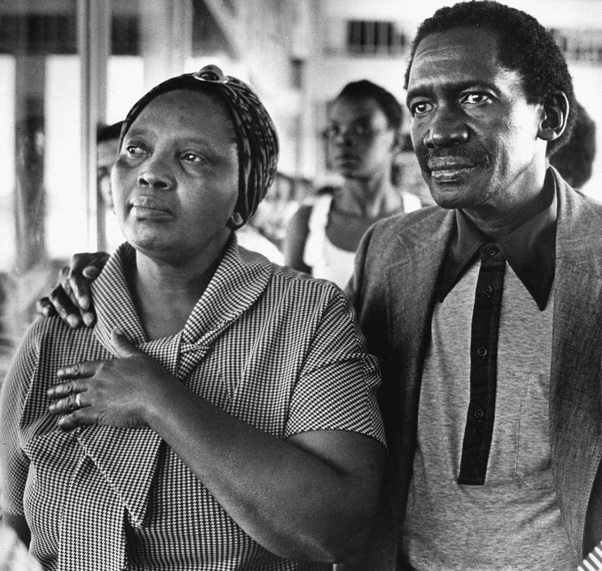 In 1997 Mrs Sobukwe appeared before the Truth and Reconciliation Commission (TRC) in her bid to find the truth about the cause of her husband’s death. (see her actual testimony in the References below). She exposed the ill-treatment and humiliation suffered by Robert Sobukwe while he was in jail and how the apartheid authorities refused her husband access to proper and independent medical examination. Ma Sobukwe demanded of the TRC that the doctors who treated him and the staff on Robben Island, who had reportedly mixed broken glass into his food, make a full disclosure before any amnesty be considered. She was concerned that he had been poisoned and wanted to know the truth. The South African Government conferred the Order of Luthuli on Mrs Sobukwe in April 2018 for her tenacious fight for freedom and her steadfast support of incarcerated freedom fighters. Mrs Sobukwe passed away on 15 August 2018 in Graaf Reinet, Eastern Cape, South Africa. • Ndaba, B. and Molosankwe, B. (2018). Who was Zondeni Veronica Sobukwe?, from The Star online. Available at https://www.iol.co.za/the-star/who-was-zondeni-veronica-sobukwe-16575323 . Accessed on 15 August 2018.